This panel is its own “Sluggo Saturday” entry. Some people don’t like the new Nancy strips. A tip o’Sluggo’s cap to J. Caleb for singling out this amazing panel. You are 100% correct. I haven’t enjoyed a newspaper comic strip this much since I was 13. This one made me laugh out loud: https://www.gocomics.com/nancy/2018/09/04. I wonder what the rationale for Sluggo’s name is these days. His original characterization was “tough kid from the wrong part of town,” so I presume the name meant that he was prone to slugging people. That would probably not be accepted for a child in a comic strip now, and anyway it no longer fits the way he is presented. So…He frequently defrauds vending machines with slugs? He’s slow as a slug? He leaves a trail of mucous behind him? Any ideas? Maybe the course to take is to change his last name. Let it no longer be Smith, but rather Sluggington or Slugworthy or something like that, with “Sluggo” being a nickname derived therefrom. Yes, Jasper Portarlington Slugworthy. That is what I shall assume his full name to be, from here on. The new “Nancy” is the “Frank Miller’s ‘Spirit'” of comic strips. I just spent 20 minutes going through some of those newer strips. Great, dry sense of humor. Charming minimalist art with a lot of subtlety. The comments, though. Geez. Can’t please some people. 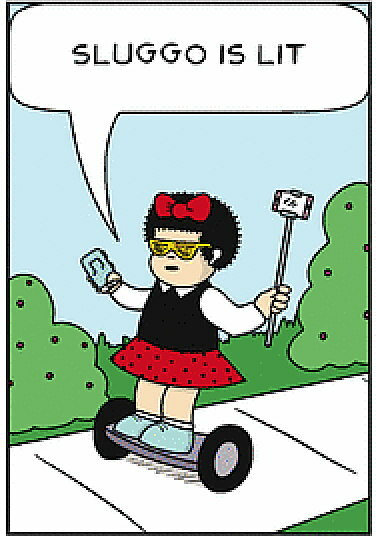 Wait…there’s new Nancy comic strips? I’m so out of touch. That’s fantastic!